Paradigm shifts are simply changes that produce culture shocks of different magnitude. The word paradigm is quite old. Paradigm first appeared in English in the 15th century, meaning “an example or pattern,” and it still bears this meaning today. Paradigm shift was popularized by Thomas Kuhn in 1962, when he used the term ‘paradigm’ to refer to the conceptual frameworks and/or worldviews of various scientific communities. Since then, the use of the term paradigm shift has expanded to include changes in business models, lifestyles, cultures, even beliefs. This is a very useful and thorough definition which you can read when you get time. These shifts are easily be recognized after they have occured, but are often dismissed even while they are creating irreversable changes in the way people live and act. Paradigm shifts may take years, even decades, to become visible or may happen in a matter of months. As a result, there can be significant delay between the enthusiastic use of a new paradigm by early adopters and the grudging acceptance of the new paradigm by the majority. Sometimes the new paradigm is never adopted by the majority because they do not trust the judgement of the early adopters. 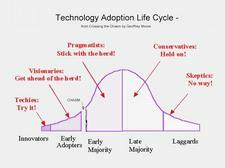 That failure of adoption is shown by the gap in the life cycle labelled “chasm”. Geoffrey Moore’s book is fascinating reading if you are interested in technological changes. For example, weblogs were originally a list of useful or interesting links to visit. Now they have become bully pulpits for all manner of causes. They may even become a great new force for marshalling support and influencing opinion. I love “Crossing the Chasm.” It’s a brilliant model that still seems totally relevant. The idea that so many minds are active in so much change is a humbling one.